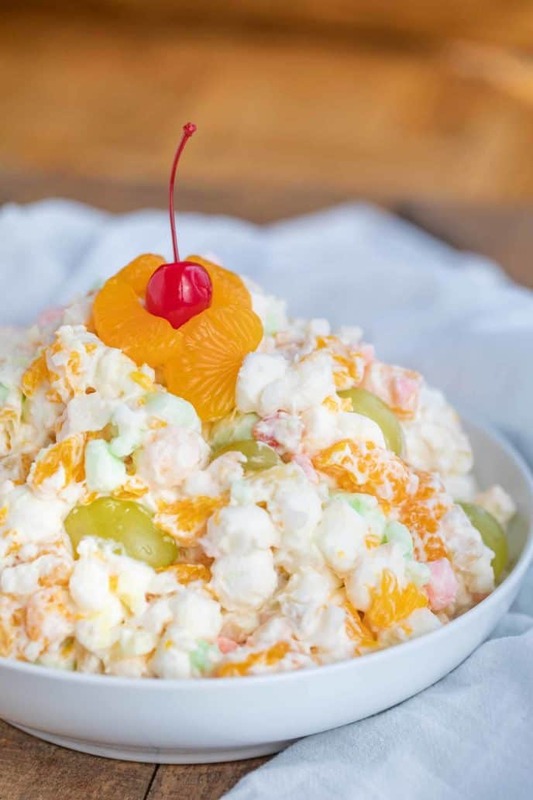 Ambrosia Salad is a CLASSIC no-bake dessert made with whipped cream, marshmallows, shredded coconut, and juicy pieces fruit, and only takes a few minutes to make! 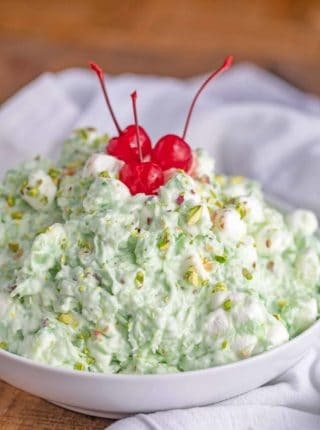 We love desserts that are easy to make and great to serve at parties, like the classic Watergate Salad (Pistachio Delight), Frog Eye Salad and White Chocolate Trash Snack Mix. 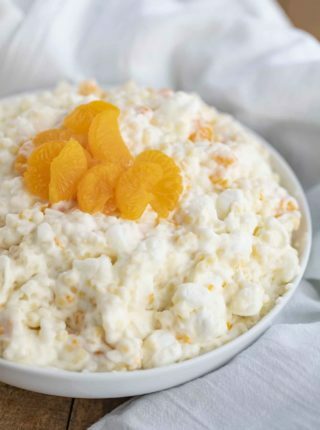 Ambrosia Salad is a quick and easy dessert, made with pieces of fruit and shredded coconut folded into whipped cream and sour cream. It’s sweet, fluffy, and ready in only minutes. This ambrosia has a really quick prep time of under 10 minutes, so it’s great to pull out when you have guests coming over. I like to refrigerate this salad for a total time of two hours, and serve it cold, so all of the flavors have a chance to come together. This is a creamy, light, an sweet fruit salad recipe that’s great for potlucks and holidays! WHERE DID THE CLASSIC AMBROSIA SALAD RECIPE ORIGINATE? 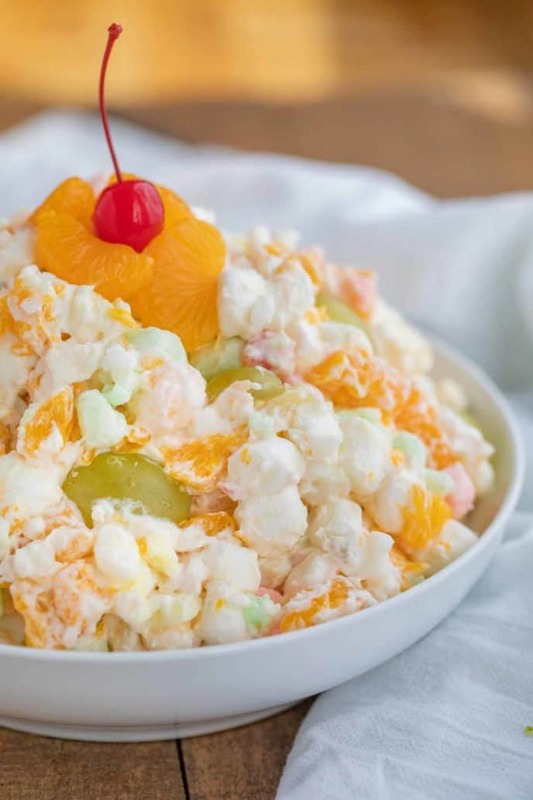 Ambrosia Salad is a sweet fruit salad that started in the united states in the 1800s. It’s a dish that’s named after the food of the gods in Greek mythology. 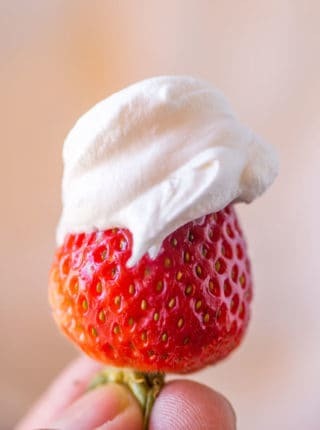 You’ll find ambrosia commonly served in the south around Christmas, made with both whipped cream and cool whip. CAN YOU MAKE AMBROSIA THE NIGHT BEFORE? This salad tastes the best when it’s served cold, so it’s perfect for making the night before and refrigerating until you’re ready to serve. CAN YOU FREEZE AMBROSIA SALAD? You can freeze ambrosia salad in a baking dish, wrapped tightly. Then use an ice cream scoop and eat it like ice cream. If you want to make this salad ahead of time, I would make the whipped cream and freeze it. Then when you’re ready, defrost in the refrigerator, and add the fruit pieces right before serving. 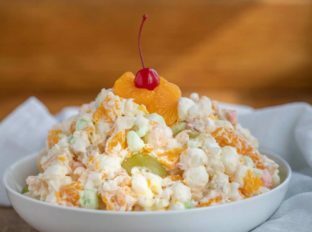 HOW LONG IS AMBROSIA SALAD GOOD FOR? Ambrosia salad will last in the refrigerator for 2-3 days, wrapped tightly. You can substitute cool whip for the whipped cream in this ambrosia recipe if that’s what you have. Top ambrosia with chopped nuts for decoration. Try pecans, pistachios, walnuts, or cashews. Try making this ambrosia with my homemade marshmallows, cut into small pieces similar in size to store-bought mini marshmallows. You can use fresh fruit, or store-bought fruit cocktail for a faster version. Different ambrosia recipes call for different types of fruit. Try grapes, mango, strawberry, kiwi, or banana. You can also use regular oranges instead of mandarin orange. Maraschino cherries will turn the whipped cream red. If you’re making this fruit salad the day before, add them right before serving. Mix this salad with half whipped cream or cool whip and half cream cheese for a more indulgent dessert. You can use canned pineapple tidbits, crushed pineapple, or cut up fresh pineapple for this salad. If you’re using canned pineapple, make sure to drain it first. 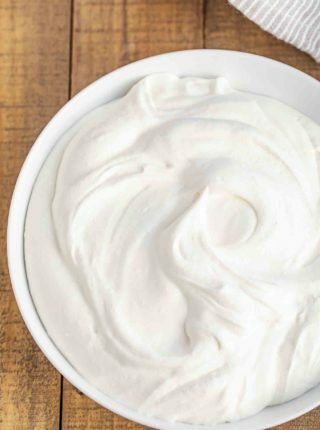 Make this ambrosia healthier by using greek yogurt instead of sour cream, or light cool whip instead of whipped cream. Whisk 1/2 teaspoon of cinnamon into the whipped cream for extra flavor, or top this fruit salad with sprigs of fresh mint. Whip the heavy cream and powdered sugar until it forms into whipped cream then fold in the sour cream. Very carefully add in the marshmallows, coconut, mandarin oranges, cherries and pineapple chunks then refrigerate for at least two hours before serving. Top with a couple of oranges and cherries as a garnish if desired. Looks like the frogs eye salad my mom used to make! Definitely making for my next family function! It’s such a classic! Enjoy. This is such a yummy salad! It is so refreshing & tasty! It goes great with so many dishes! I love this easy and delicious classic ambrosia salad! I have such great childhood memories eating this salad! I am saving this recipe for sure!